[Note from Pandemonium Aviaries: Although our mission is aimed at saving endangered birds of New Guinea, stories of people making special efforts to save any bird warms our hearts. 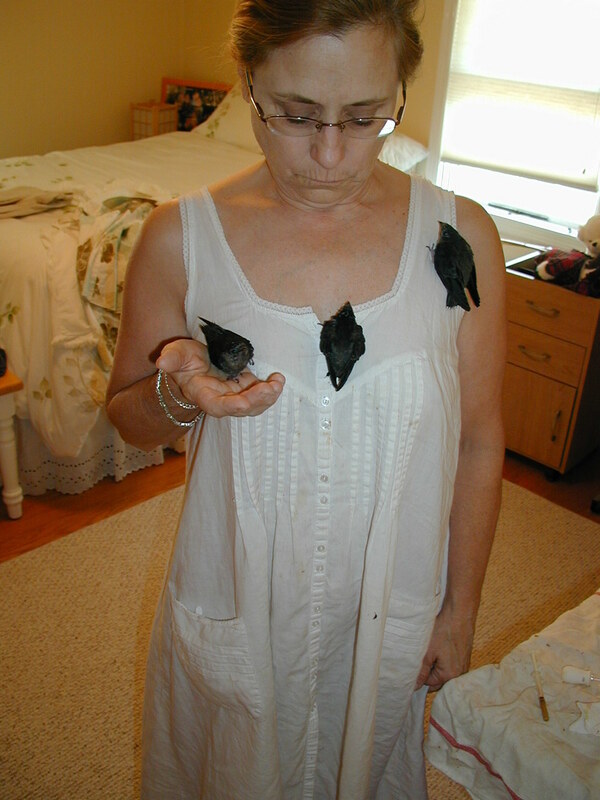 After all, Pandemonium Aviaries had our start with saving a single bird. Who knows where this story will go? Chimney swifts. Dominated (stole) a whole weekend plus some weekdays from us. Started when Helen heard chirping in our chimney. Opened up our woodburning fireplace insert and there were two fledglings on the grate. So into the basket with straw they went. Quick review of the literature was dismal. Once out of the nest and inaccessible to mother swift, some experts say put them out in the woods and let nature take its course. They exist on a diet of half-digested insects that the parents catch. Substitutes won't work - per the literature. But a local vet said try a watery slurry made of a certain dry catfood. So, we did. These guys were very heat stressed and dehydrated. We fed and watered them while building a hanging basket to put them back into the chimney. Then we heard more chirping. Found big brother trapped at the bottom of the chimney but above the grate at the top of the fireplace insert. Don't let anyone tell you animal rescue is the most fun you can have with your clothes on. Because, the way it worked out after I moved the 300 lb. insert out of the fireplace mouth, Helen stripped down to near nekkedness to squeeze into the sooty chimney and grab the third bird. Much more practical from a cleanup standpoint. Well, we nursed them with water and the vet's suggested catfood gruel. We tried to put them back at the top of the chimney but the nest had broken off the wall. We hung a basket inside the flue and hoped the parents would return, but the parents had moved on and it was 115 up on the roof. That same day, we retrieved them, and for two days Helen fed them by hand. Then, she rescued a baby robin. Finally took all of them to an animal rescue place down in Birmingham where they have an artificial chimney just for swifts! One of them could flap and 'fly' about 6 feet. And all of them already were tenacious climbers and grippers. They will be artificially fed but otherwise kept in the well-populated chimney where, per the rescue workers, the adults teach the fledglings what they need to know. Good on 'em I say! Chimney swifts are my favorite bird. We get whole flights of them at dawn and late afternoon every day. Great to listen to their chittering calls and to watch their aerobatics. Even have seen them mate in mid-air, something I would not have believed possible if I had not read about it. Talk about coitus interruptus. They come together (collide), lose aerodynamic lift, plummet like stones, then separate and...that's that. So next breeding season, I'm going to hang a rough-surfaced vertical plank in our unused chimney flue and hope they come back to nest. Fabulous birds Not terribly bright, but equipped with all the instinct they need. See attached photos for example of the gripping, climbing instinct. Older PostYour Opportunity to Visit the Amazon!